I absolutely love cute food ideas! Little furry monsters made out of cheese balls? Yes please! Inchworms made with grapes? Don’t mind if I do! There are so fun many ways to get creative with your food. 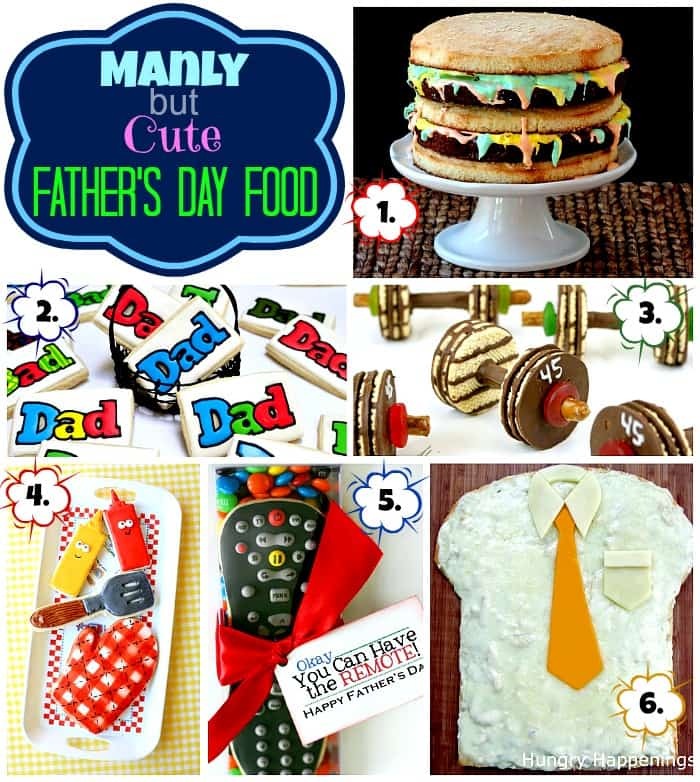 With Father’s Day quickly approaching, I’ve gathered some adorable (yet still totally manly) ideas that would be perfect food for dad. Don’t forget to visit our Father’s Day page for even more fun ideas. 1. Big Mac Cake by the talented Karyn behind Dieters Downfall and Pint Sized Baker. What dad wouldn’t want to dig into a massive cake that resembles a delicious burger?! 2. Super Simple Father’s Day Cookies by Hani with Haniela’s. I know what you’re thinking…these deliciously adorable cookies don’t very “simple” to make. I promise that you’ll be surprised when you walk through the steps outlined by Hani. 3. Barbell Cookies by Sarah with Miss CandiQuik. Have a dad that can’t get enough of the gym & working out? Tell him to take a break on Father’s Day and enjoy these “weights” instead! 4. BBQ Cookies by Sue of Munchkin Munchies. My dad never did a lot of the cooking at home but his specialty was always the BBQ. If your dad is a grill master, he’s sure to appreciate these adorable BBQ cookies (no grillin’ required!). 5. Remote Control Cookie by Ashleigh from Somewhat Simple. Yes, that remote control is 100% edible! How funny would it be to swap out the regular remote control for this one? Perfect for Father’s Day and April Fools! 6. T-Shirt & Tie Pizza by Beth with Hungry Happenings. Before you indulge in all of the delicious sweets mentioned above, you’ll want to share a few slices of this adorable pizza made just for dad! If your dad wears a uniform, perhaps you could even use a food coloring marker to write his name on the pocket. Thank you to all the lovely ladies mentioned above for agreeing to share your fabulous posts with the Moms & Munchkins readers! For more fun holiday ideas, follow us on Facebook, Twitter, Pinterest and Bloglovin’. Thanks for including my Shirt and Tie Pizza in your roundup of cool Father’s Day food. Super cute Father’s Day ideas! Thanks for sharing at Simple Supper Tuesday. Some really cute food ideas! Thanks for sharing these. Thank you so much for including my Barbell Cookies in the mix!!! Such a great collaboration of Father’s Day Ideas. Pinning now! Thank you for sharing this at Memories by the Mile. They are all so clever any father is going to love any of them. I featured you on today’s post. Yes, I love all of these fun ideas! The creativity of these women amazes me! Thanks for stopping by. Great ideas! =) Saw your post at “Memories by the Mile”! Love the Remote Control cookie! Yes, the ladies that made all of these creations are incredibly talented! I’d love to make the remote control one for my dad.